We are all about books for kids, and our family has a huge collection of children’s books. Here are our family’s top 9 favorite books! Today I want to share with you 9 of our family’s all time favorite books for kids. (If you like videos better than reading posts, there is a YouTube video that I made about these books for kids at the bottom of this post!) Last week I wrote THIS post all about my lifelong love affair with children’s literature and why I decided to start selling Usborne books, which were a favorite of mine as a teacher and are now a favorite of mine as a mother. My sister told me that when she looked at the Usborne Books & More she was super overwhelmed and that I should make a list of my top 5 – 10 book choices from there. Here is that list! My top 9 Usborne books for kids! 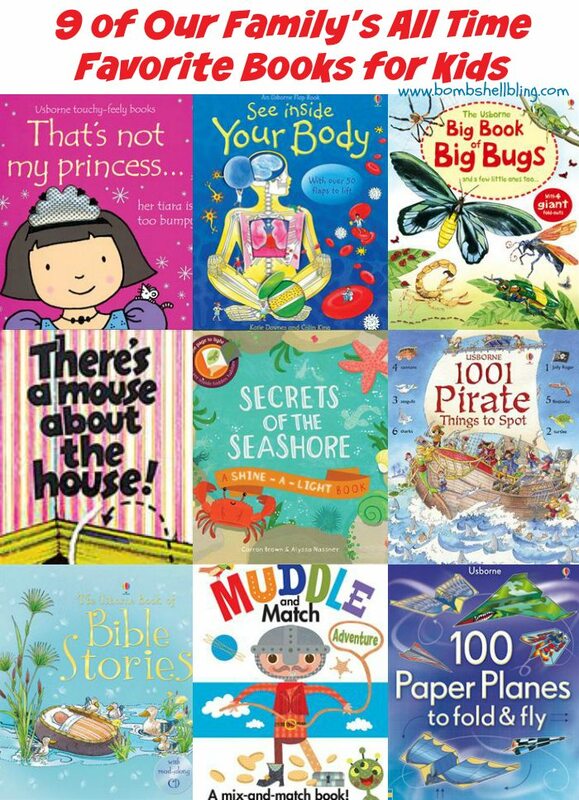 I am proud to be an Usborne Independent Distributor, and these are links to my branch of their website. Please let me know if you have questions or need recommendations! You can do it in comments section or email me at bombshellbling@gmail.com. READING ROCKS!!! I think that this is our #1 favorite right now. When the kids were littler it was the “That’s Not My . . .” series (next on this list), but this is a book that can intrigue toddlers wanting to flip flaps and inform older kids. My husband is training to be a doctor and is super impressed with the detailed information in here. He and my son love to read it together. These are the BEST for babies!! Touch and feel books in loads of varieties that are super cute AND super durable! My kids both adore this book, but especially my son. 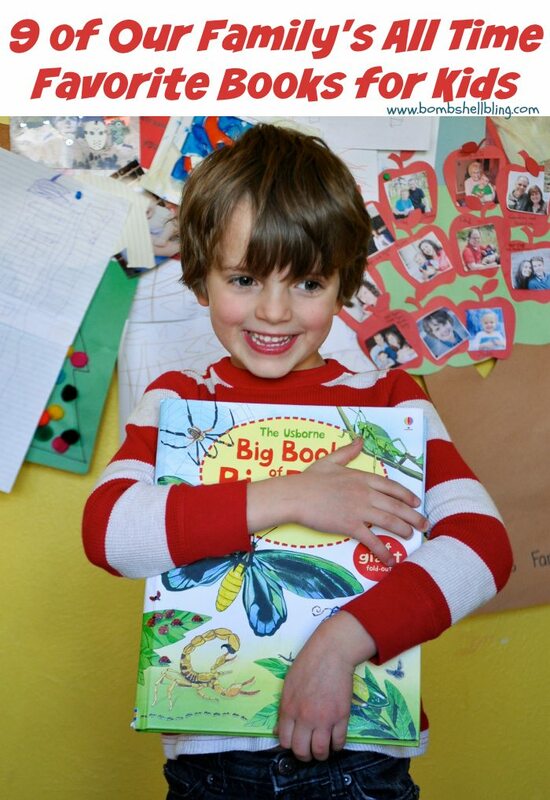 We also have “The Big Book of Big Monsters,” and we are eyeing the rest of the collection! Packed with gorgeous illustrations and fabulous info, these books are super interesting and very sturdy as well! These books are new to me, but I love them!! Each page has a story and a picture, but the pages are broken into three sections that can be flipped around to create silly stories and pictures. My toddler loves making silly pics and my boy loves reading the silly stories. This book has provide MUCH giggling in this house! Plus, we did our own Muddle and Match Activity! You can see that idea HERE. This activity has taken over my son’s life. True story! I love that the instructions and paper are coded by the color of the teeny plane in the corner of the paper. The papers are very cool and designed to look extra cool when folded properly. We love reading this book together at night. It is designed with an easier sentence at the top of the page for a kiddo to read, and then the adult reads the bottom sentences. My son is just starting to be able to read the top ones, which is really fun! It’s Where’s Waldo? pirate style! And what kid doesn’t love Where’s Waldo? There’s a whole series! I have my eye on 1001 Things to Spot at Christmas and 1001 Things to Spot in Fairyland next! This series is just plain FUN!!! Perfect for bedtime stories!! You can see above the pic with the lights on and with the lights off and a flashlight behind it. You can see them with lights on and a flashlight behind it too, but it’s cooler in the dark. There’s a Mouse About the House! Another super fun book for little people. (There’s also a squirrel one.) The mouse can slide through the openings to the next page and follow the path to the next opening, taking it through the story as you read it aloud. Cute cute cute! Here are a couple more posts that you should check out if you love Usborne books or children’s literature! 20 Incredible Activity Books for Kids of All Ages! « S’mores Popcorn Recipe: S’MORES SATURDAYS IS BACK !! !